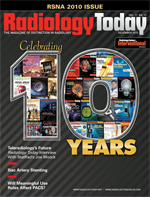 Although there are more potential avenues to funding, the rules could prove problematic for radiology. Wendt says even though improved PACS efficiency isn’t directly related to meaningful use, improved image sharing benefits the entire medical community. The University of Wisconsin’s radiology department is currently limited to internal funding for its regional outreach projects, according to Wendt. External funding would not only allow them to pursue more projects, it would also potentially provide a greater return on investment.